You are here: Home / Friday / When Do Houses Come on the Market in Charlottesville? 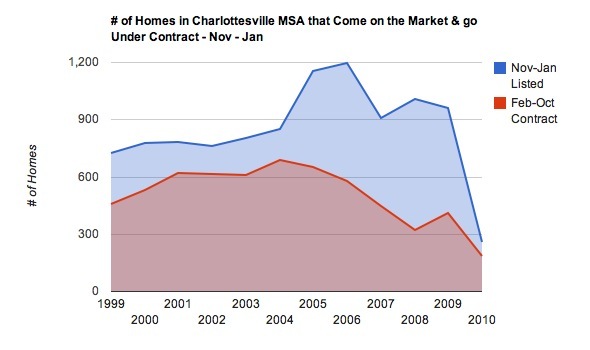 When Do Houses Come on the Market in Charlottesville? Coming next week – answers. 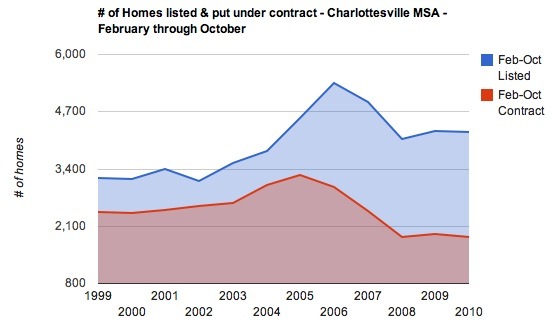 – When do houses come on the market in Charlottesville? – Should I take my house off the market over the holidays? – When should I put it back on the market? – Are sellers more negotiable over the winter? * # of Homes = Condos, Attached & Detached homes. I’m looking more for volume trends than anything else. I’ll update this chart in February 2011. If you want to see the raw data, send me an email. I’m having some issues embedding the Google Docs spreadsheet. Great data! It seems your market has the same pattern as the Augusta market. Hopefully this spring we will start to see a rising trend.